GameMastery Map Packs provide everything you need to stay a step ahead of your players. 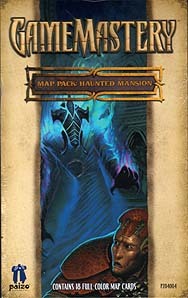 Use this product to build haunted mansion encounters that perfectly fit your campaign. Additional map packs explore other locales of interest to fantasy gamers. This Map Pack contains 18 full-colour 8" x 5" map cards suitable for use with or any standard gaming miniatures. Cartography by Corey Macourek.